I don't know who invented the stuffed burger, but they are my hero. Seriously. What could be better than gooey cheesemixture, spicy chilis, or savory veggies packed inside a delicious hunk of meat and hot sauce or barbecue sauce? As summer approaches, my family, friends, and I look for pretty much any excuse to celebrate in the sunshine with some creative meat patties. Get yourself a bunch of hamburger buns, grab a sauce of your choice - hot sauce, bbq sauce, steak sauce, chili sauce - because here are the recipes for the best burgers you've ever had! With so many mouth-watering options, where do you start? Well, this list of the 15 best stuffed burger recipes, of course. The total time for any of these burger recipes is pretty short, you can change the recipes a bit to your taste, i.e. add more black pepper or use blue cheese instead of pepper jack cheese and so on. Not gonna lie, I'm a sucker for some avocado. But this burger will convince even the less-avocado inclined. Add the kick of spicy mayo, and you've got a melt-in-your-mouth winner. The best part? Since you don't have to melt the center (like with juicy lucies and the like), you can leave a little pink in the middle! Begin your avocado-burger dream here. Two of America's best comfort foods combine in this delightful stuffed recipe. Something about that creamy mac n' cheese and that slightly blackened burger just makes my heart happy. Not to mention my stomach! Most recommended for those who want to accomplish complete satisfaction. If you didn't think I could top the last one, ha! I present you with this mac and cheese AND bacon stuffed burger. But really, with the salty bacon, gooey mac and cheese, and juicy beef patty, how could you go wrong? Meat, carbs, meat. All of your favorite things, finally together. Just make sure you're up to date on that cholesterol prescription. A caprese salad - in a burger! Melted mozzarella cheese with zesty tomato and flavorful basil inside a burger will sate your urges for Italian food while giving you another excuse to grill out! Bonus: it looks absolutely incredible. Just look at it. And then add the recipe to your list. The combination of cheddar and beef is a classic for a reason. It's hard to beat. This recipe might just accomplish the win by adding spinach to the inside of the burger and cherry tomato with asparagus bruschetta to the top. It makes for a slightly more grown-up version of the tasty, beef and cheddar tradition. Be right back, I'm gonna make this thing... And you should too. With this one, you take some of the best ingredients for the outside of the burger and instead melt them inside. Then all those awesome ingredients that you stuffed inside fuse into a lava core of amazing flavor. Add a bit of spice to a bit of bacon and I don't know about you, but I can't resist. Trying to cut back on red meat AND enjoy a delicious barbecue? This feta-stuffed turkey burger could solve your dilemma. Top the slightly lighter, Greek-style patty with roasted red peppers and pesto to enjoy bursts of big flavor. Ready to make it? Start here. The only thing that could improve upon a jalapeno popper? Surrounding the cream cheese and jalapeno not with breading, but with beef. You get everything you love about poppers-- the spice, balanced with creaminess-- but with the added satisfaction of a burger. Is there anything more delicious than fresh mozzarelle? You guessed it. 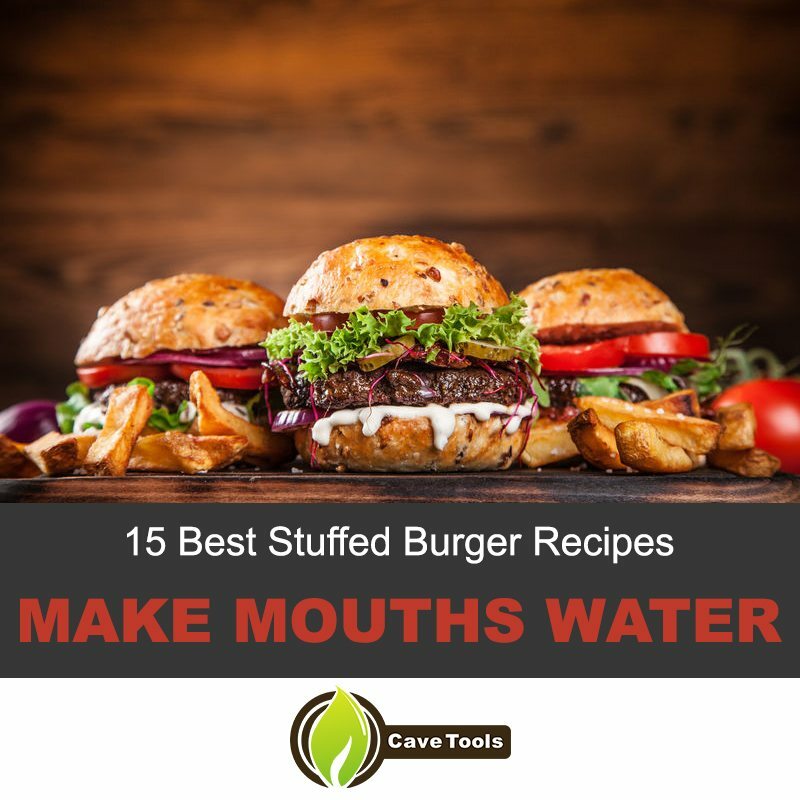 Mozzarella melted into a gooey ball in the center of your mouth-watering burger. Simple, yet divine. These guys know how to live. The blue-cheesy, chunky gorgonzola cheese mixed with crispy, salty bacon creates a flavor profile not to be scoffed at. It's intense, yet palatable. Plus, you'll feel extremely fancy. Even in a T-shirt and shorts. We all know the combination of seafood and beef is amazing. So why not take it to the next level with this burger? Stuff that shrimp into your burger and enjoy the incredibly juicy and delicious creation. (Best with a bit of garlic butter.) Try it to believe it. Ahhhh yes, jalapeno and cheddar, welcome to my stomach. Once that sharp cheddar cheese melts to combine with the spicy jalapeno, you'll have an irresistible savory treat on your hands. It tastes great with either a beef or a turkey patty. Make it, and you'll see. If you love food, you can't help but delight when you see flavorful peppers, onions, and mozzarella stuffed into a steaming burger. And then when you taste it... You remember how good it is to be alive. It's almost like a pizza burger. But for grown-ups. Trying to impress a date or out-do your friends? I recommend starting with this gourmet stuffed burger. Rich, sophisticated tastes blend into a cacophony of awesomeness. In other words, it tastes real good. Check it out. No stuffed burger list would be complete without this classic flavor combination. I've already yammered on about the delectable nature of cheddar and beef together, so I'll leave it at that. Just know that you'll always remember your first bite of this stuffed beauty. Learn how to make it here. The rest is history. What can you stuff in a burger? You can put a wide variety of ingredients into your hamburger including avocado, mac and cheese, bacon, tomato, basil, mozzarella, spinach, jalapeno, feta cheese, and more! Take a look at some of the recipes on this page to get a better idea of what you can make! Are bacon and cheese stuffed burgers delicious? Yes, stuffed burgers are a new take on the classic hamburger. You can combine all kinds of ingredients to make new and unusual burgers! Bacon and blue cheese stuffed burgers are particularly delicious and you can view how to make it on this page along with many other stuffed burgers. What is a beer can stuffed hamburger? You take ground meat and form it around the bottom of a filled beer can. After this, you can fill the opening with whatever you want to create your beer can lean ground beef stuffed hamburger. Ready to get out there and start grilling some of these amazing stuffed burgers? I know I'm chomping at the bit for some warm weather barbecues. ​There's nothing better in the world than grill burgers, drink beer, make some hamburgers with bbq sauce and sunshine with your friends or family. Do you have any thoughts or recipes you want to add? Please post in the comments below. And if you liked my list, share the knowledge. Burger lovers unite!